This is a celebration of an artist, creative self-expression, freedom & throwing out the rules! I have had the honor of creating with seniors for almost 20 years. Even now, I find myself amazed and inspired by the power art. Eleanor was a 92 year old client of mine and she is legally blind. Eleanor is highly educated, extremely opinionated, and was used to doing woodwork and handcrafts in her earlier years. Creating visual art was a new venture, but she enjoyed other channels of expression such as poetry, music and drumming. In the beginning, Eleanor was eager to explore the various art mediums and projects that I would introduce (although, she did ask me on more than a few occasions if I was crazy). Since she has limited vision, she literally works with her face just a few inches from the table. We have created systems together to help her “see” and feel her space. She would often get discouraged and I can recall the day she literally threw a paintbrush full of bubblegum pink paint across the studio nearly hitting me in the leg. She was “frustrated as hell” and she wanted to make it known that she was QUITTING! “I can’t do this!” She blurted out. There it was. The beginning of a journey right then and there, at nearly 90 years old. I acknowledged her frustration and empathized with her. No, things were not the same as they once were, and these challenges were not going away. Her life was different, and she wasn’t happy about it. The numerous changes seniors face and the feelings that accompany them, surely cannot be easily explained or expressed. The art and the creative process grew to reflect deep meaning for Eleanor. Art became her way to reject those “rules” which no longer exist. I would give her complete freedom, control and encouraged her to use anything and everything she wanted in her work. We laughed when she explained how her creative ideas tend to come to her at 3 a.m. (something I can relate to!) As time went on, she would come down to the studio and excitedly open her walker and reveal some odd fun thing she collected somewhere to use in her artwork. I would also find objects from nature or in my travels and bring them to her knowing that she would see the item in a unique new light. Eleanor’s pen and paint response to a dying friend which she gave to her as a gift. She was free! She knew that whatever she created was hers. There was no right, no wrong and no judgement. It no longer mattered if others approved…Eleanor was truly seeing once again! 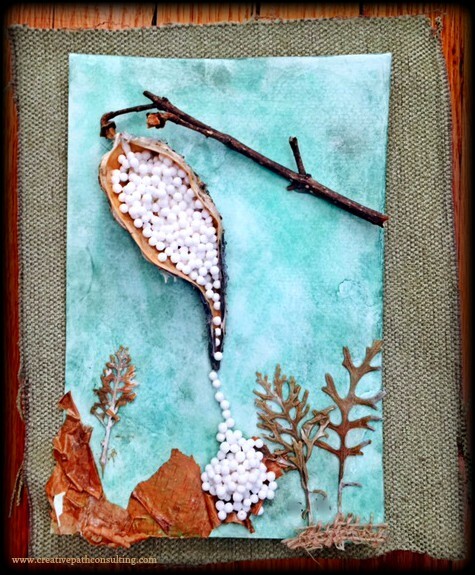 She used all kinds of things for her art, nothing was off limits…Paper scraps, tapioca, coffee beans, bottle caps, old paper towels, and some old girdle straps she had laying around and on and on. She thought out every detail of what she was working on. These materials and the process took on such significance to her, and she was having a ball! What an honor and pleasure to witness her growth! She was able to express her memories, feelings of loss, grief, her love of nature, create visual metaphors and to explore creatively for no other reason than to be her true self. Working as a team, she would often use my hands and eyes as needed, directing me to her very detailed instructions or written words that she wanted conveyed. She very often explained how art has become such a vital part of her life. It’s not that frustration has completely left her, it’s her new vision and choice to not give up or step away if she so chooses. No one will ever tell her again how her art should be. It’s all hers and what bliss that is to discover! Every story matters. Everything we create from within has meaning and purpose. Our creative paths can continue throughout our lives if we are open to the journey. So perhaps if we all look just a little closer, we too may see beauty in tapioca and girdle straps & Live our Own Inspired Life! I love windows. I always have. Especially old run down windows that have peeling paint and those old levers on the side. The ones where the glass has a rippled look and the view as we see it, is not crystal clear. 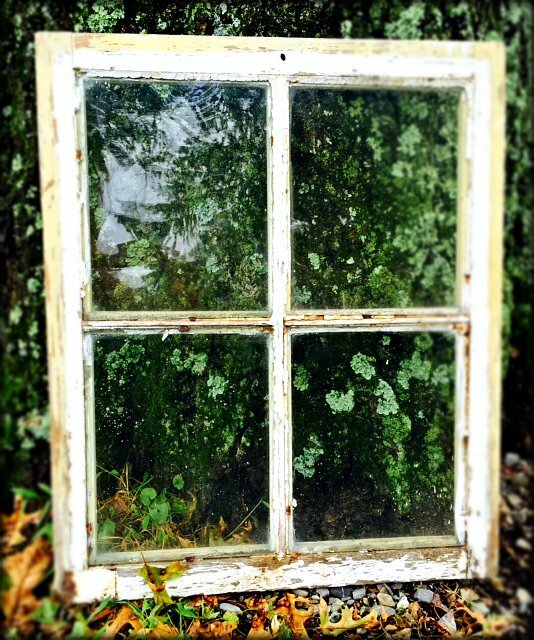 The old glass, the old windows, those are the ones I like to paint on and give a new creative life to. I see windows as a metaphor for the process of art making. I work specifically with senior citizens. I am an art therapist and I have made it my life and my passion to bring art and self expression to these most special people. I find art and the process of art making to be a very powerful means of story telling and creative expression. This is especially the case where words are hard to come by when people are living with Alzheimer’s Disease and other forms of dementia. In this article, I will share how my path led me to work with seniors, how art and connection helps the aging soul, and give an example of a client of mine who is living with Alzheimer’s disease but is using art to reconnect to his family and even to himself. Earlier in my career, I had worked and volunteered with other populations. I have worked in various settings with children and young adults. However, it was my experience of working with geriatric veterans with varying psychiatric diagnoses that guided me in to where I am now. It wasn’t until several years into my work with seniors that I had a revelation. An true awareness of my role in the lives of seniors. One day I was running a “relaxation spa”. A program I designed to bring a sensory experience to those living with Alzheimer’s and the goal was simple: Pamper, touch, smell, relax and enjoy. I had candles (yep, back then we used real ones and it was lovely! ), lavender scented oil, and tea served in beautiful china teacups. I was sitting across from a woman who was moderately impaired from this disease. She had her head down to her chest and her eyes closed. I gently washed her hands with a warm cloth and began rubbing scented lotion on her hands and arms. All of a sudden, from her relaxed state, she looks up in my eyes and said, “You know, God sent you to me.” After giving her a hug I had to excuse myself for a minute to fully take in what she said and gain composure. Her words were profound and something I never thought of until that moment. Yes, I was in the place I needed to be for her and for me. It was a clear message. It was more than just a relaxing program. It was the connection to another human being in a personal and loving way. We all have the ability to deeply connect with others. We have the power to bring life fulfillment to others and enhance quality of life. This was my path and what I was meant to do. Art therapy is my window of expression for myself and in my work with others. 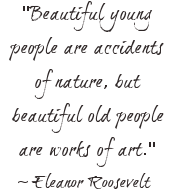 It is my belief that art is good for the aging soul. I know I am not alone in this in belief . Dr. Gene Cohen, M.D., Ph.D. was a world renowned pioneer in the field of geriatric psychiatry. He wrote books and conducted studies on this topic of creativity and the aging brain and the positive effects such as growing brain cells and improving general and mental health and social activity. It is not only the art itself that is meaningful, but the art making process that is what I focus on with my clients. I often start my art groups with people shaking hands and acknowledging the person next to them and passing this greeting around the group until it comes back to me. I think offering a sense of warmth and community is so important to these people who often are less social not by choice but by circumstance of the illness. I have seen the artistic process be a sense of community and connection between group members. I have seen it take on a very lively social role including conversations and reminiscing. I very often see group members encourage and praise each other and their creative accomplishments. There can be a lot of singing and laughter during an art session. There can be music or creating Art can be a quiet, calming and meditative experience. It can offer a way to express feelings that may be too difficult or perhaps impossible to express verbally. Overcoming resistance to creating art is a common challenge when working with the elderly. It is clear that many people stopped creating at an early age. It is also not uncommon to hear stories of how creativity was squelched by a teacher or parent. The truth is, anyone can create art. Anyone with a desire and encouragement can do it! There are no rules in art and I make this point clear to the people I work with. Their creations are just that…their creations no right or wrong and no judgments. No artistic experience is needed to participate in art therapy. His words and his image were so telling to me. He knew in his heart he was not able to paint as he once did. He was aware at that moment that things were different and he was not happy. 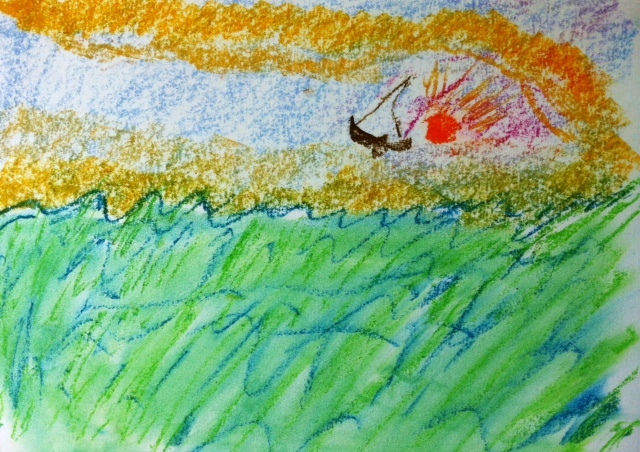 I also found his subject interesting…A lone boat sailing in the distance towards the sunset. How alone he must feel. Art is there to tell his story. Since this time, Howard has painted several paintings. Each one focusing on a family dog and tells a story about them with a costume that he carefully selects for them depending on their personality. 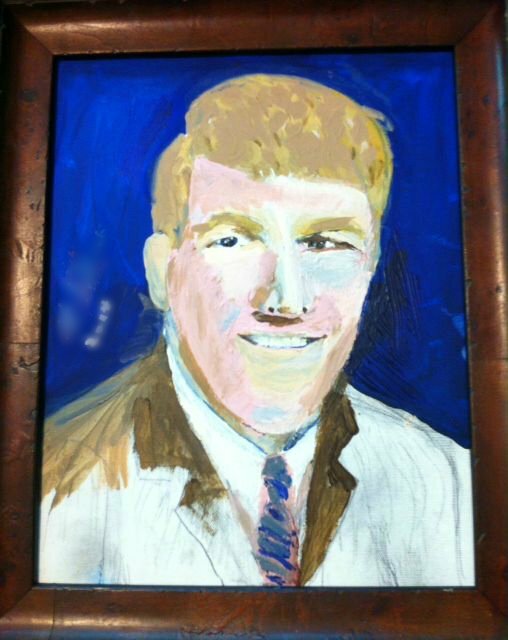 He also paints portraits of family members and presents them as gifts, lovingly framed by his wife. 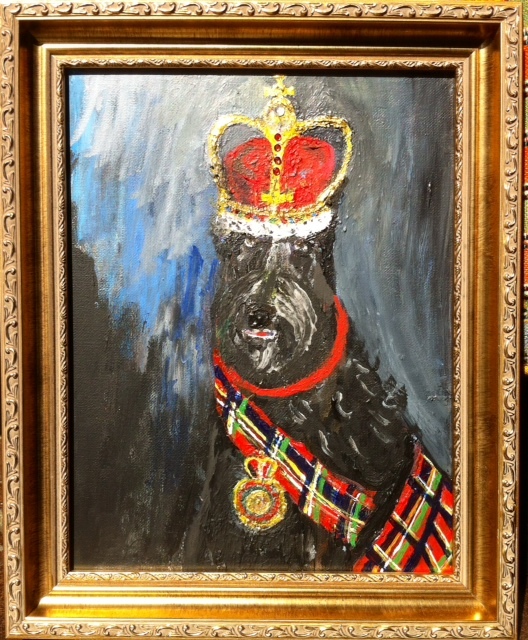 Below is a picture of his Scottish terrier. He presents him as a Scottish King complete with tartan and medals. He puts much thought and deliberation into each detail. While he is still quiet and often defensive, it is clear that being an artist is who Harold is. His art and creative time are very fulfilling to his life and he has a true purpose. This final painting was created almost a year after I first met Harold. He stated, “This painting is the most important one yet. It has to be right. It’s for the family.” This amazing painting was created in the memory of his oldest son who passed away from cancer. You can see the growth and reconnection to his former self, his love of art, and it’s powerful presence in his life. His art inspires his family as well as myself. There is no Alzheimer’s when he is with his art. He is who he genuinely is. Art is his voice. I am grateful to be able to hear the countless stories and memories that are told through art. Working with seniors creatively is tapping into not just areas of their brains, but more importantly, to areas of their hearts. It is powerful, healing, fun and valuable beyond measure. It is the window to our lives and who we are…Maybe the panes aren’t always clear but they still have a view worth sharing. Art is for Everyone…Right? The Answer May Surprise You. I realize this is a topic in need of discussion after receiving inquiries about the challenges of creating art with people living with advanced Alzheimer’s disease. As an art therapist and consultant, I visit all types of senior settings and interact with staff members and witness these challenges on a daily basis. So what about art and how does it fit in? 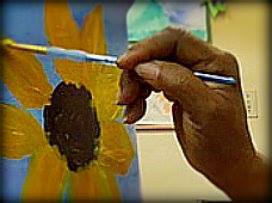 Can’t anyone in long term care benefit from art? The answer truthfully is no. According to Viktor Lowenfeld, Scribbling is the first stage we all go through in our artistic development. This however does not occur until about 2-4 years of age. When people digress into the late stage of the disease process, their brains can no longer recognize an art material. It may be consumed as food. This would not be a once in a while occurrence, rather it is the person who consistently is unable to recognize or connect function with any material that is in their hand. I refer to this as pre-art (pre-scribbling) and it is in this very late stage that an expectation of artistic expression or even art exploration is unrealistic. This is not to say we should infantilize them…they are adults! However, we must recognize and acknowledge that the brain is no longer able to make connections that are needed in utilizing art materials in their own creative process. But I thought art is good for everyone? Yes, art is an amazing way to engage people in very profound and personal ways. It can be a means of expression when the ability to verbally express oneself is limited. 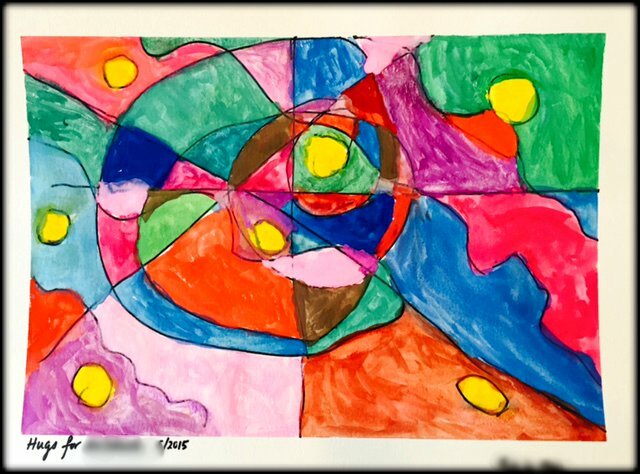 Studies have shown that art therapy is capable of enhancing brain function, socialization, and even communication in people who are living with dementia. Art is INCREDIBLY helpful in giving expression and voice to thoughts, feelings and stories. It offers a better quality of life for people in various stages of Alzheimer’s…That is until they can no longer recognize an art material and perhaps mistake it for food and/or cannot remain alert to participate in the art task. This is not to say that as people decline in the disease process, we should stop using exploratory materials, showing artistic images and discussing topics that once interested this person! I often feel there is a certain amount of pressure in long term care to make sure everyone is “occupied” and kept “busy”. This is especially true when there are many behavioral issues (often occurring simultaneously) as a result of dementia. This ideology is based on appearance and quantity, but certainly is not therapeutic or quality care. Very often I have seen staff members wheel people up to a table who were completely inappropriate for the art task and proceed to make art for them and even sign the senior’s name. I was an activity director for many years, I get it. It is our job to meet challenges, keep everyone happy (as if this is even possible! ), find strengths and make sure everyone is engaged. However, things may need to be viewed differently and changes should be made to accommodate the best interest of the seniors. Ask yourself: Who is benefitting from the art program? Is the art for them or for you? Be very clear with yourself and with administration. Even families may not fully be ready to understand and accept the disease progression of their loved one. What are the needs of the seniors? What would be in their best interest? Who would truly benefit from the art process (note I said process and not the end product). We should not lose sight of the fact that it is their journey and exploration not ours. When running an art group with seniors living with memory impairment, it is crucial to keep the group small. Intially, it may seem unrealistic to have only a small handful of people in an art group…(especially with those demands and expectations!) However, we are talking about people who are living with Alzheimer’s…they deserve to gain from the creative experience! Having too many people in a group will decrease the focus and attention of the group members, decrease the intimacy of the interaction between participants and will have the facilitator going from person to person without actually being present to hear the stories that are shared through the artistic process. But, we need to be very clear about what our motives are and art may not be the best intervention at this point. Music, sensory stimulation, TLC, pet therapy, aroma therapy, story telling/reminiscing and laughter are some of the wonderful interventions for the late stages of Alzheimer’s disease. Wishing much peace, light & creativity to you and the seniors in your life. 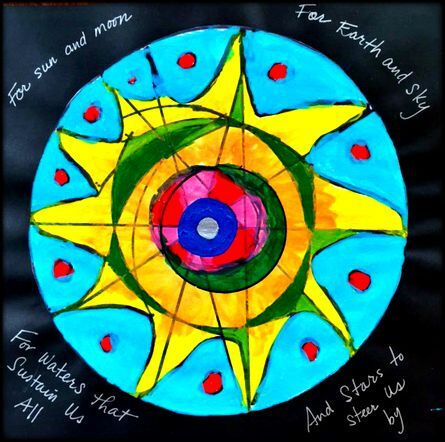 Why Hire an Art Therapist as a Creative Consultant? "Many of the clients that attend our program are living with Alzheimer's and dementia. Michelle tailors her Creative Arts program to meet their needs as she focuses on their strengths, abilities, interests, and memories."